The Comex gold futures contract confirmed a bottom with a positive weekly chart on Dec. 7. The contract moved above its 200-day simple moving average at $1,257.0 this week and has been above its 200-week SMA at the same time. This sets the stage to buy gold mining stocks. My favorite miners are Barrick Gold Corp. (ABX and Newmont Mining Corp. (NEM - Get Report) . Barrick has been above its 200-day simple moving average at $12.35 since Oct. 15 and a "golden cross" formed on Nov. 27. Newmont is below its 200-day SMA at $35.48 but this stock has had a positive weekly chart since Nov. 2. A "golden cross" occurs when the 50-day SMA trends above the 200-day SMA, indicating higher prices lie ahead. Gold miners Yamana Gold Inc. (AUY - Get Report) and Goldcorp Inc. (GG - Get Report) are more speculator choices as they are both deep into bear market territory 39% below their 2018 highs set in January. Yamana closed Thursday at $2.29; between $1 and $3 a share is what I call an "option on survival". Goldcorp is trading below $10 a share the threshold that prevents many equity money managers from adding this stock to their portfolios. The weekly chart for the gold futures contract is positive with the precious metal contract above its five-week modified moving average of $1,237.0 and above its 200-week simple moving average of $1,235.1. The 12x3x3 weekly slow stochastic reading is projected to end this week rising to 77.47, up from 71.81 on Dec. 14. 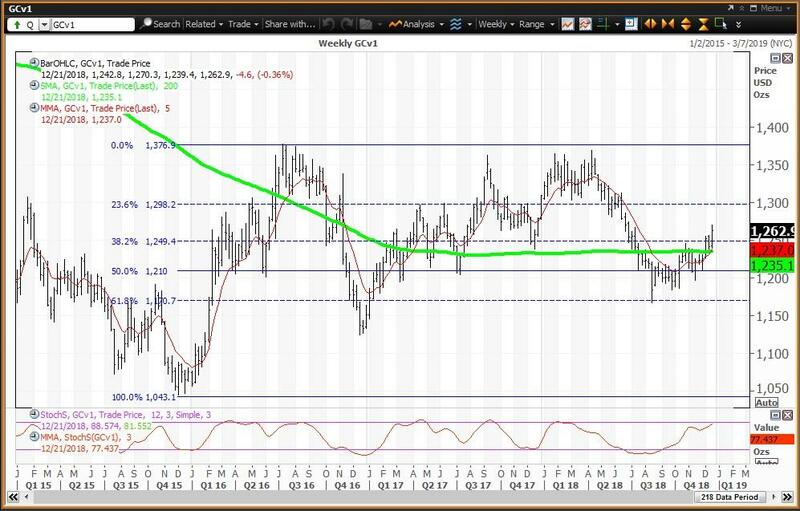 The horizontal lines are the Fibonacci Retracement levels of the rally from the December 2015 low of $1,043.1 the troy ounce to the July 2016 high of $1,377.5. Given this chart, my trading strategy is to buy weakness to the 200-week SMA at $1,235.1 and reduce holdings on strength to the 23.6% retracement level at $1,296.2. The upside into 2019 is $1,500 and higher. 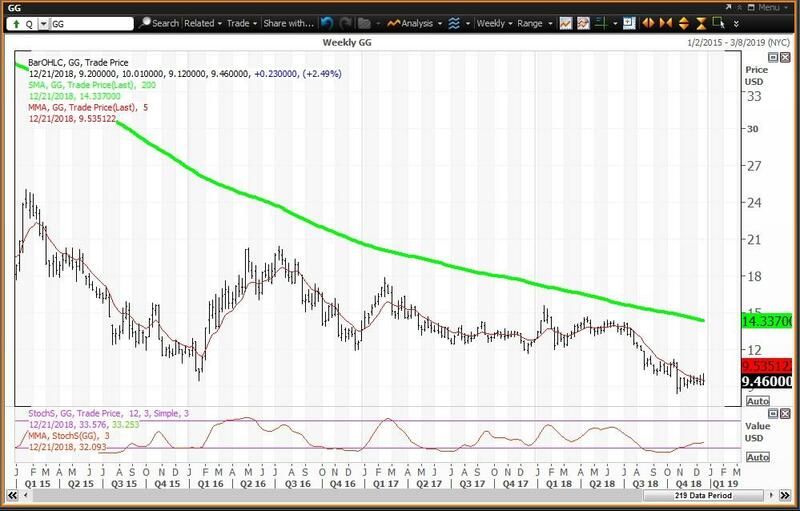 The weekly chart for Barrick Gold is positive with the stock above its five-week modified moving average of $13.06. The stock has failed to breakout above its 200-week SMA of $13.94 since the week of Oct. 26. 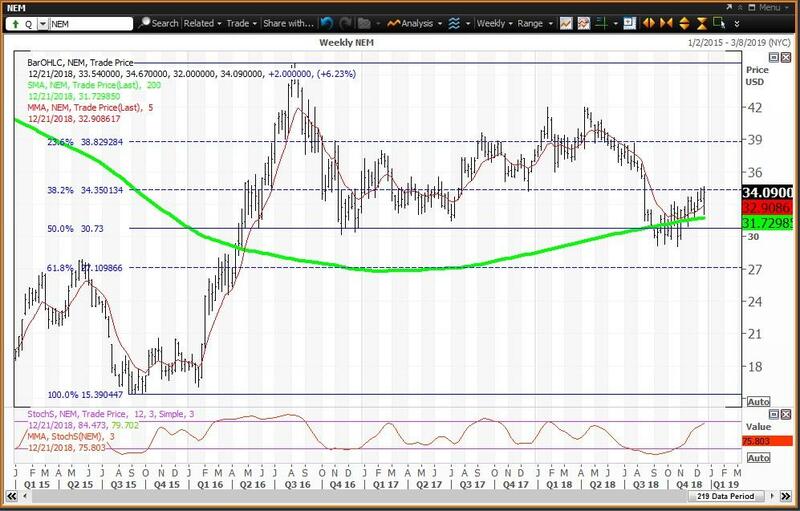 The 12x3x3 weekly slow stochastic reading is projected to end the week rising to 79.61 up from 77.95 on Dec. 14. The horizontal lines are the Fibonacci Retracement levels from the September 2015 low of $5.91 to the July 2016 high of $23.47. Given this chart, my trading strategy is to buy weakness to the 61.8% retracement level at $12.61. If the stock breaks out above the 200-week SMA at $13.94, add to positions and then reduce holdings as the stock climbs the wall of retracement levels - 50% is $14.70, 38.2% is $16.77 and 23.6% is $19.34. The weekly chart for Yamana Gold will shift to positive this week on a close above its five-week modified moving average of $2.26, which targets its 200-week SMA at $3.04. The stock is trading between $1 and $3 a share, which is the range I consider as an "option on survival". Investors are putting their money into this stock knowing the risk that this holding could become worthless. The 12x3x3 weekly slow stochastic reading is projected to rise to 21.68 this week moving above the oversold threshold of 20.00. 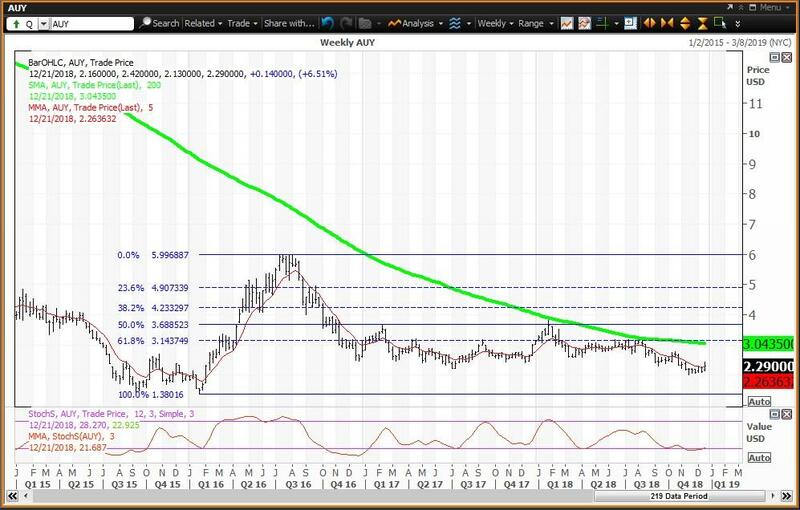 Given a positive weekly chart, Yamana should rebound to the 200-week SMA at $3.04. If this happens, you can track the stock climbing its Fibonacci Retracements as shown on the chart. The weekly chart for Goldcorp needs to close this week above its five-week modified moving average of $9.54 and is well below its 200-week SMA of $14.33. The 12x3x3 weekly slow stochastic reading is projected to inch higher to 32.09 this week up from 31.35 on Dec. 14. Given this chart, my trading strategy is to buy a close above $9.54 for a trade up to $14.33. The weekly chart for Newmont Mining is positive with the stock above its five-week modified moving average of $32.91 and above its 200-week SMA of $31.73. The 12x3x3 weekly slow stochastic reading is projected to rise to 75.80 this week, up from 71.47 on Dec. 14. The horizontal lines are the Fibonacci Retracement levels from the August 2015 low of $15.39 to the August 2016 high of $46.07. Given this chart, my trading strategy is to buy weakness to the 200-week SMA of $31.73 and add to positions at its 50% retracement at $30.73. 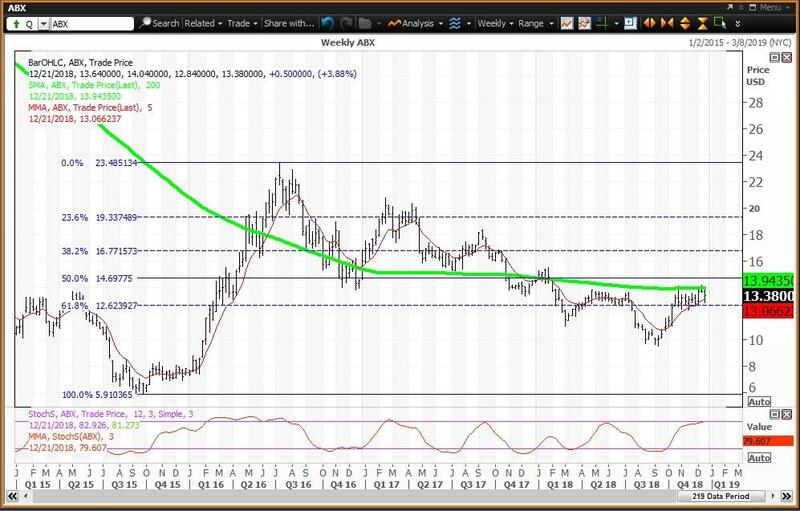 A move above the 38.2% retracement of $34.35 targets the 23.5% retracement of $38.83.